Texas' latest round of school finance litigation adds some new players to the courtroom, with interests that are more varied than ever before. We've put together a cheat sheet to help you keep all six lawsuits straight. 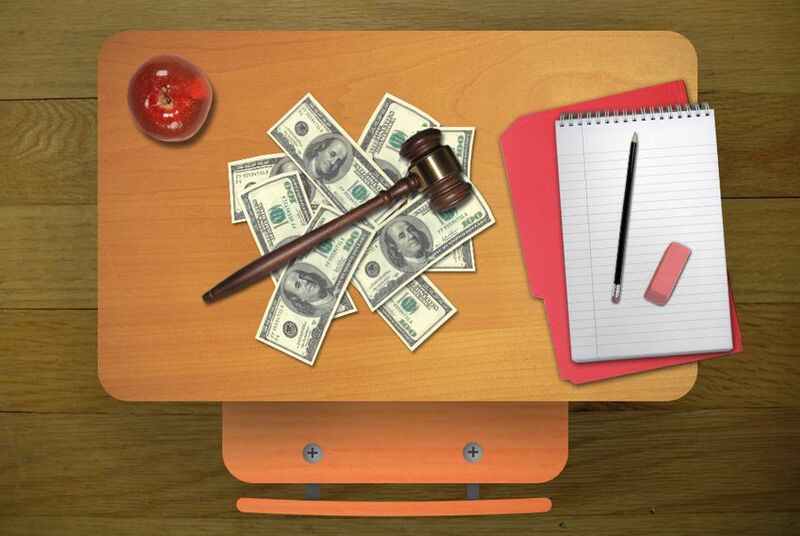 Texas' latest round of school finance litigation adds some new players to the courtroom, with interests that are more varied than ever before. We've created a cheat sheet to help you keep all six lawsuits — and the plaintiffs' basic arguments — straight. A judge has already consolidated these five lawsuits into one trial, and will likely do the same with the latest claim, filed by the Texas Charter School Association. In many instances, the plaintiffs' arguments will overlap, but in some, their interests will conflict — that's why there are so many different parties. The Texas Constitution requires that the state must fund its public schools efficiently and adequately. It also prohibits a statewide property tax, a provision that courts have interpreted to mean that school districts must have "meaningful discretion" in setting their property tax rates. Efficiency: Three different plaintiffs are using this language to ask for three different outcomes. The Equity Center lawsuit is using "efficiency" to argue that the inequity in the school finance system is unconstitutional. Claims from the Mexican American Legal Defense and Educational Fund and the Fort Bend ISD group also touch on this argument. Charter schools take a slightly different approach. They argue the cap on charter contracts and a lack of facilities funding impede their growth, which they believe makes the system unconstitutional. Another party, Texans for Real Efficiency and Equity in Education, says that because the state doesn’t know how much it costs to educate a child, there’s no way the system is efficient. Adequacy: The adequacy argument is based on the charge that the state has failed to dedicate enough money to public education for schools to meet increasingly rigorous standards. Case in point? The 2011 Legislature cut roughly $5.4 billion from public education and didn't fund an influx of 80,000 new students amid the rollout of a new accountability system based on the STAAR exams. All of the lawsuits, except those brought by TREE and the charter school association, bring up this argument. Meaningful Discretion: In underfunding public schools, some plaintiffs argue, the state has not given local districts enough choice in setting their own property taxes — in effect, instituting an unconstitutional statewide property tax. All of the groups except for the charter schools and TREE, which dropped this part of their complaint in response to a motion from MALDEF, make this argument. Looking for more details? Download the six court filings — and the state's response — at the top left of the page. Want a linkable and printable version of the chart? It's here. Still confused? 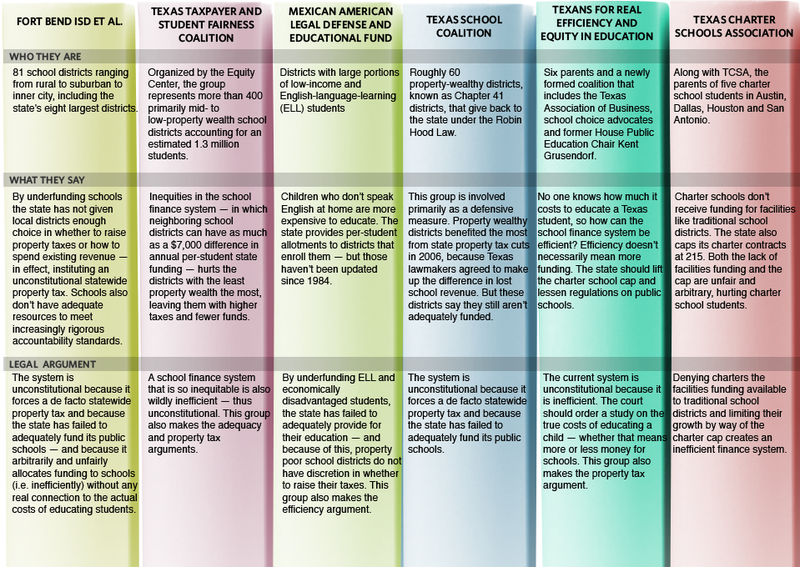 Check out our guide to navigating school finance in Texas.